American-born Julie Montagu exemplifies a life of passion and dedication. Now very much a Londoner… a Lady of London in fact, the renowned Yoga teacher, mother of four, food blogger, Author, TV star and successful business owner, shares her secrets to success and happiness, and what healthy living really means. welltodo London’s Editor-in-Chief, Lauren Armes, met with Julie to find out where it all started, what inspires her, and how exactly she fits it all in. You’re very well respected in the London Yoga community and passionate about it… so where did it all start? I’m a small town girl, now living in London. My husband is English and together we have four kids aged 16, 13, 10 and 8. So it’s a bit crazy in our house. I’ve always been doing Yoga… ever since I was pregnant with my first child. When you’re pregnant, you are so exhausted and you rely on all sorts of things. After my fourth was born, I went a bit crazy. I was working full-time in post-production. I decided to take a year off which is when I really got into Yoga. I trained as an instructor in New York… and then I started flyering around Wandsworth (with a baby in a push chair) and renting Church halls to teach Yoga. They were humble beginnings… I’d pray that people would turn up so that I could break even and I did that for a year. Then I started teaching at The Power Yoga Company and by word of mouth I expanded my teaching to Equinox, Grace Belgravia and now primarily triyoga. What about your interest in nutrition? What inspired that? I studied nutrition with IIN because I wanted to teach people about a holistic approach to wellbeing. But rather than wanting to work with individual clients, which was taking up a lot of time, I created an online nutrition course – with the help of my husband who works in film editing. A lot of people can’t afford to do the IIN training course. So we created an online nutrition course, one of the best basic nutrition courses out there, which only cost $49. It’s very interactive – you learn about basic nutrition: green leafy vegetables, whole grains, good oils, natural sweeteners, superfoods, and how to integrate that into your everyday diet. Off the back of that I got my first book deal! So you’re going to be a published author? When can we expect to see your book? Yes! I started a blog 3 years ago called The Flexie Foodie. It’s all about incorporating better food into your diet. At the end of 2015, Hay House are publishing my [second]book which will be based around the online course I created – in a lot more detail though. But… before that, I’ve also been signed with Quadrille who are publishing my first book which is available from 12th March. 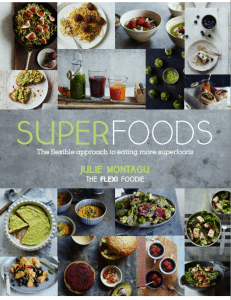 It’s called Superfoods and it contains 90 plant-based recipes. It’s really exciting! And then there’s your role in the popular TV series ‘Ladies of London’? Tell us about that? Yes, I’m part of the main cast for Season 2. I am playing myself of course, the Yoga teacher that cycles everywhere throughout London. We’re hoping to change the stigma attached to reality TV and it’s a lot of fun to be part of that. The season premiers on 2nd June. You mentioned that you cycle everywhere… is it for fitness? Not necessarily for fitness or even because I can get to places faster… My number one reason for cycling everywhere, even in the rain or snow, is because I feel so much better when I get to my destination. I get on my bike some mornings in the worst mood ever and I can guarantee that within 30 minutes I’m happy and feeling so much better. I cycle to get my endorphins up! With cycling, once you start doing it, you get a feel for it! But my number one rule is: never ride next to a lorry. I’ll always wait behind to be safe. What else have you got in store for Londoners this year? I’m very excited about plans for my JUB range. That’s Julie’s Unbelievable Balls! They’ve been available on a smaller scale for a little while now, but we’re scaling up and expanding the product range and have some really exciting developments to announce this month. So the question everyone wants to ask you Julie… how do you fit it all in? I cannot even begin to tell you how much I love what I do. When you find your passion, it’s almost becomes another a child. My kids are my everything, and then there’s my passion. Whilst it’s not equal to my children by any means, it is something for myself. I give a lot to my kids, but then it’s important to do something for me too. I just get it all done because I enjoy it. What advice would you give to anyone wanting to pursue their passion as a career? I think if you work really really hard, you can get there, but if you find your passion then I don’t think you ever give up. You also don’t expect to have it handed to you on a silver platter. If you start from the grass roots, it doesn’t matter if you have all the connections in the world… you still need to work hard. You also have to be authentic, approachable, kind and friendly… and people will gravitate towards you because they see that you really love what you do. Finally, what do you think is the key to taking responsibility for your health? People need to be educated and Londoners are definitely searching it out. Around food and being healthy, it is like anything… it’s a mindset. If you’re not feeling good about yourself, you’re going to eat crap food. When something happens in your life, your mental response will dictate your behaviour – either to punish or reward yourself. You need to find something that you love so that whatever happens you can go to that activity, like yoga for example. Then you make it a pattern to feel good. It’s the same with food. Make it a habit to turn to healthy practices, to turn to green juice or an incredible salad. Habits take 28 days to form, so it takes commitment initially, but the benefits will become so obvious that you won’t want to stop. Julie Montagu teaches Vinyasa Flow Yoga at triyoga. 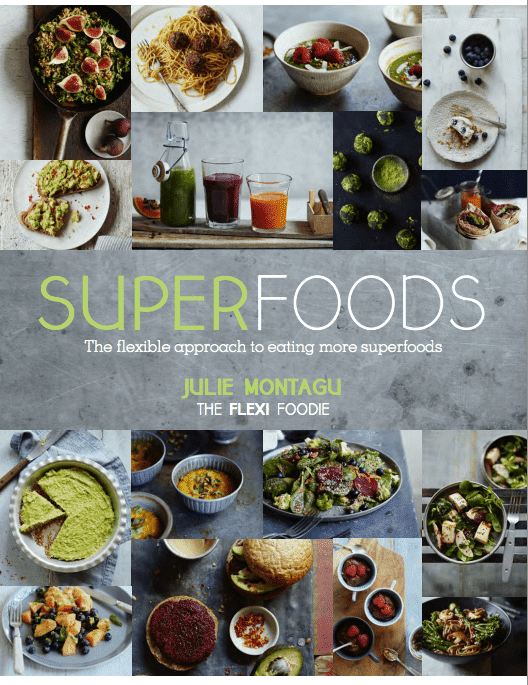 Her first book, Superfoods, is available for pre-order on Amazon now. Follow Julie on Twitter, Instagram and Facebook for advice and inspiration for living a healthier, happier lifestyle in London.